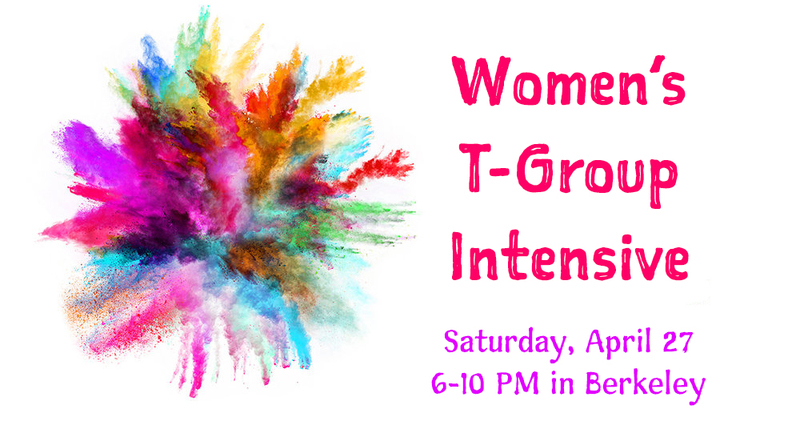 This will be an intimate gathering of women for an evening of intensive T-Group practice. First-time participants are kindly asked to please watch the Training Video before joining us. Perhaps your pattern is that you tend to feel on the "outside," no matter what group you're part of. Or perhaps you're the one who tends to serve as the "lightning rod," drawing the tension and frustration of the group towards yourself whether you want it or not. Patterns can also be found in the roles we habitually assume in groups. Are you the caretaker or are you the instigator? The silent observer or the harmonizer? And lastly, we can find patterns in the ways we automatically respond to things like silence, eye contact, conflict, receiving others' attention/appreciation, or witnessing others' difficult emotions. T-Group is a living mirror that can reflect you back to yourself, making it far easier to wake up to your patterns, the impact they have, and the responses they elicit from others. And with this new awareness and choice, T-Group becomes a laboratory where you can experiment with different ways of being and relating - and witness for yourself the different impact and response that comes back to you. When you make the discovery that you’ve been the architect all along, you can begin to learn how to build the structures you’d actually want to live in: connection, depth, understanding, enjoyment, intimacy, and love. The perennial question at our T-Group gatherings is, “What is T-Group and how do we practice it?” It is a subtle and ambiguous practice by design, and it continues to elude our attempts to pin it down once and for all. It is so much more about observing what’s already happening than it is about making something happen in particular. There’s no one “right” way to T-Group, but you can read about the structure of the practice on the Training Video page (a written outline is available in addition to the video itself). If that’s the “what,” then you can find the “why” on The Layers of Practice page, where I’ve outlined the rough progression of skills and capacities that grow stronger with ongoing T-Group practice. But what I will say here is this: the power of T-Group comes from our collective willingness to Reveal. In group, we take the risk of sharing who we really are, what we’re actually experiencing, and what’s truly happening in the space between us, which is why we call it a practice of “authentic relating.” Another word for this is “vulnerability,” and the powerful discovery we make in T-Group is that rather than being the thing that costs us connection, vulnerability is the thing that creates it. We humans need connection, love, and belonging in the same way we need food and air. In a modern world where we’re having more communication than ever before, but somehow less actual connection, T-Group is a practice and a place where we can learn the skills that allow us to create the kind of intimacy we all need. It also gives us the tools we will need when it comes time to navigate the inevitable tricky passages of deep relationship. Why do we call it T-Group 2.0? T-Group originated in the 1940's at National Training Laboratories, and it centers on the sharing of feelings in the present moment. Crystallin is deepening and elaborating up on this practice, drawing from her background in Buddhist Psychology, Systems Theory, and Group Psychotherapy, her training at The Matrix Leadership Institute, and her own extensive T-Group practice. See the Training, Advanced Practices, and Systems Theory pages to see the updates for yourself. The evening begins when we meet in the large group for a brief, silent meditation and a round of sharing that allows us to arrive and get grounded together. Returning community members break off into small, self-led groups of 5-7 and first-time participants will break off into small Training Groups, each one led by T-Group Facilitation Apprentices. All groups do two 60-minute rounds of practice, with a short break in between. The evening ends with one more large group sharing session. Even if you have done T-Group elsewhere before, I ask that you participate in at least one Training Group before joining the rest of the community. Lastly, anyone who would like to return to Training Group for further facilitation and practice is very welcome to do so! Donations to the T-Group Scholarship Fund allow individuals who cannot afford the financial contribution to attend our weekly gatherings, closed groups, and intensives. "We are here to create a Practice Community based on deep connection and authenticity, built on foundations of respect and goodwill, where all parts of us are welcome and our differences are appreciated as resources. We are also here to gain self-awareness around our habitual patterns and roles, limiting beliefs and strategies, and repetitive experiences in groups. But ultimately, we are here to re-weave the web of the human community, to remember that we are not separate and that we belong to and with one another." I organize these gatherings because I love T-Group with my whole heart. I was part of the T-Group community in Boulder, Colorado for over two years, and I am a living testament to the power of this practice. I bring a lot of prior education, training, and practice to leading this community, but I want to keep these gatherings as accessible as possible - because it was free for me and it changed my life perhaps more than anything else ever has.